What? Another Blog on Writing? 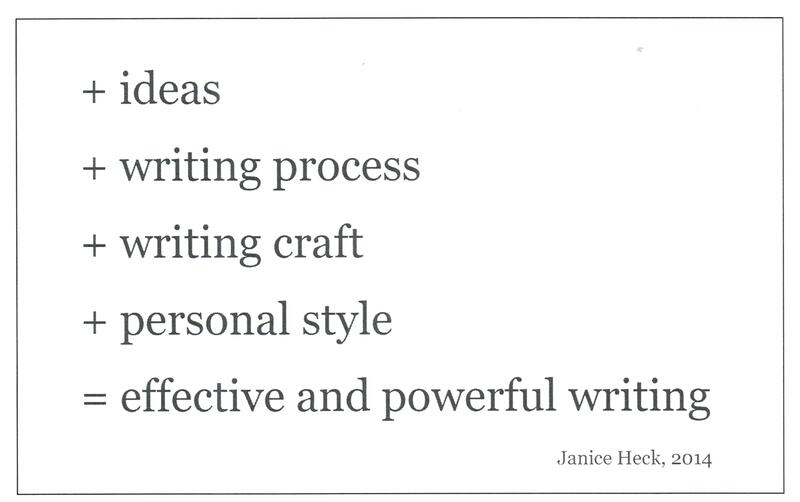 Three years ago, on a lark, I started my first blog: Janice Heck: My Time to Write. After writing 370 posts and getting over 52,000 hits, I decided it was time to reevaluate that blog and plan my next steps. You can read that post here: Dear Readers: On Flying Deeper into the Blogosphere. One conclusion of that post: I want/need to focus more on writing process and writing craft to help developing writers become more effective writers. My first blog is an eclectic blog, on which I write about such topics as CATS, travel, photography, current events, food, recipes, book reviews, family, senior health issues, and eldercare. And then I write about writing topics: grammar, usage, punctuation, writing quirks, common writing errors, “fix-its” for common errors, and effective writing tips. Quite a mix, isn’t it? Writers often hear such terms as passive voice, parallel structure, serial commas, dependent clauses, cumulative sentences, periodic sentences, and many more. But just as often, these terms seem a bit fuzzy, especially to newish writers. In this new blog, I take a writing tip and show you, with graphics, how the grammar (or usage or punctuation) works so you can translate it into your own writing. Other posts will focus on qualities that enhance your writing as well as common writing problems that interfere with effective writing. Coming soon: Look for my first official post on this blog here: One Tired, Tarnished Writing Tip…and Six Twists. So come along for the ride. Ask questions and leave comments. I would love to hear from you. Janice Heck: My Time to Write, an eclectic topic blog. She is co-leader of the Cumberland County chapter of the New Jersey Society of Christian Writers along with Kathryn Ross of The Writer’s Reverie. Jan’s favorite retirement activities are traveling, blogging, singing in the church choir, eating out, and collecting old grammar books.